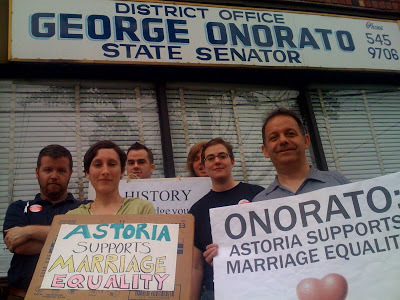 About 2500 activists turned out in Astoria, Queens yesterday to pressure state Sen. George Onorado to change his mind about marriage equality. In this clip, Donna Lieberman from the NYCLU addresses the crowd. A new site MarriageNY has been created for contacting members of the New York Senate.